Cabinet Color - What is the pain color used in cabinetry? Great. Yes, existing colors in a room can reflect onto your color choices and distort them. I checked with my client and she said it does not take on a green hue and that it is all around very neutral! Hope that helps! space on either side of stove - your work is just gorgeous! could you please tell me how much space there is on either side of the stove and/or how wide the drawers are on either side? thank you! I see what you mean. They are the same size, but it's an optical illusion. 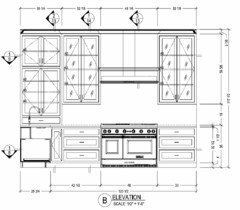 Attached are the actual dimensions from the cabinet shop drawings. Hope that helps! 8". The drawers are somewhere around 30"-36" as I recall. 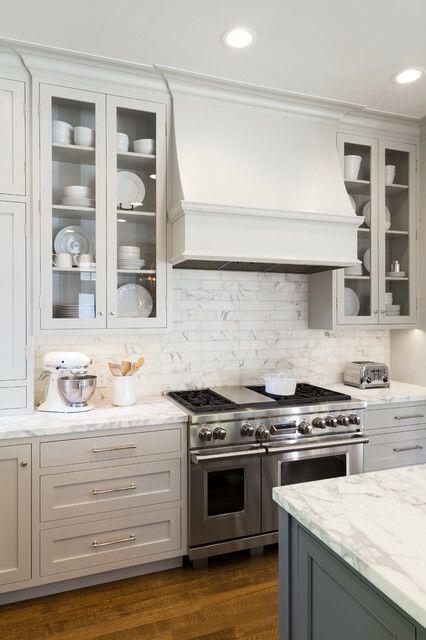 Is your cabinet hardware polished or brushed nickel? - I love your kitchen! We are trying to decide between polished or brushed nickel and want to confirm what was shown in these pictures. Thank you! does the polished show every fingerprint? Depth of cabinets almost to front of range - Great attention to detail. It looks like you pushed the base cabinets out to the edge of the stove- maybe 27"? Were you required to line the sides of the cabinets in sheet metal or was it okay that the range door was close to cabinetry? Thank you! You are so helpful- as always. We are interested in a beautiful blue Bluestar and I'll call them and check their specifications to see if there are differences. Backsplash Tile - Hi- could you share manufacturer and color of the backsplash tile? Thank you! Hi Anna! We purchased the tile from Country Floors. We asked them to custom cut 3x12 tiles for us out of 12x12 honed Calacatta Marble Tiles from which we hand selected out about 20% of the darker gray pieces. Country Floors helped by letting us know the mix in the lot (attached is a photo from the warehouse) so we knew to order 30% more in order to select out the pieces we wanted. I highly recommend them. Best of luck to you! Beautiful! - What color are your cabinetry? 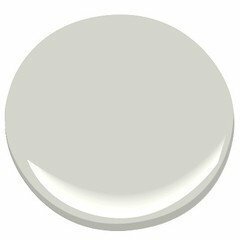 The cabinetry color is Benjamin Moore 'Owl Gray' OC-52 in satin. Your hood is simply perfect. Where did you purchase it? - I love the simplicity and uniqueness of you kitchen hood. Do you think this could be adapted for a kitchen with 8 foot ceilings? Would you mind telling me where you purchased it, or if it was custom made, the supplier who made it? Thank you! The hood was custom designed and made by the cabinet maker. Hope that helps! How did you decide on size of pulls on drawers? - I'm at the point in a kitchen renovation in which I have to choose my hardware. To me that is the jewelry of a kitchen. Yes, I think of hardware are jewelry as well! I just try a few different sizes in the drawing until I see the one I like. You could print color photos of the pulls and scale them to the size they actually are and tape them up to your drawers to get a good idea. I know another designer who does that. Good luck! Are these upper cabinets 48" tall with 6" space for crown molding? The cabinets are actually 59" tall. The ceiling height in this kitchen is 117 inches. Attached is drawing showing dimensions. Hope that helps! Backsplash - Love the backsplash. Is it same material as countertop? Thanks! The stone is the same on the counters and backsplash. 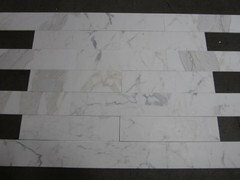 It is Calacatta d'Oro marble and the same marble tile was cut to a 3x12 size. Hope that helps!